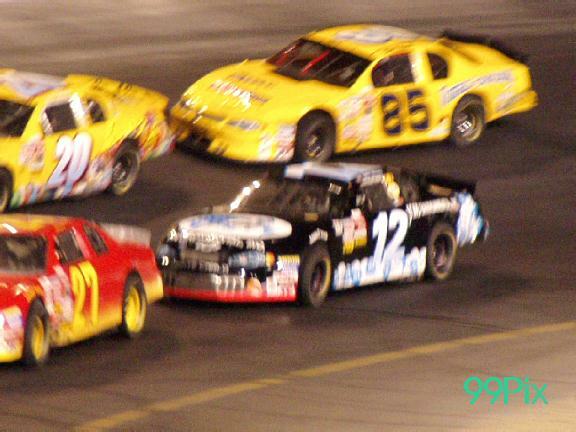 Aug. 16th, 2003 was an incredible evening of racing. 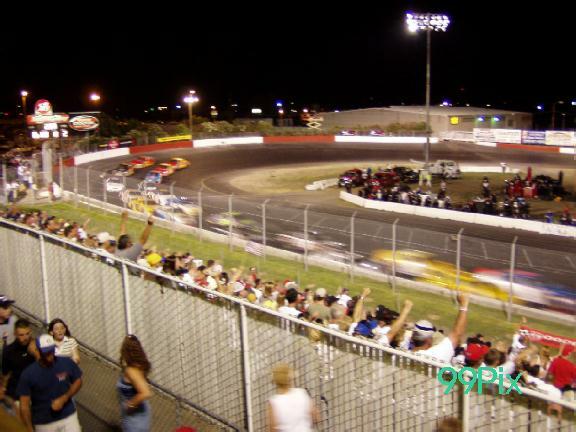 The racing brought the crowd to its feet as they cheered on three big main events including the Western Late Models, Grand American Modifieds and Pro 4 Trucks. 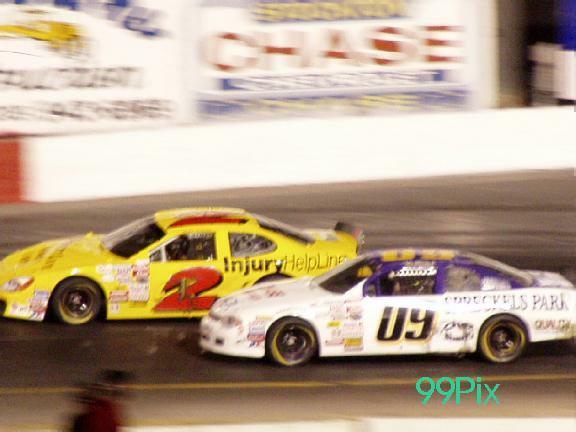 The events were followed by the NASCAR WINSTON WEST NAPA AUTO PARTS 200 DODGE COUNTRY BY HAVOLINE. 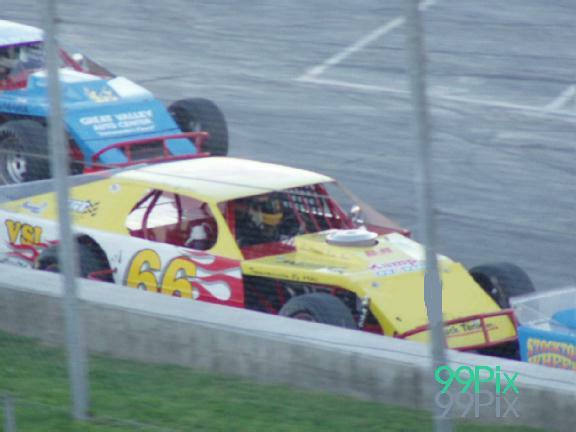 It was the richest night of racing in the 57-year history of the track and an exciting evening at the high-banked quarter mile paved oval. In the Western Late Model Division John Moore, #27, of Granite Bay had a strong start taking the lead from the outside in the HAVOLINE C.L. BRYANT sponsored division. Brock Monroe,#42, of Escalon used the same technique powered by Moore for the lead in lap 4. 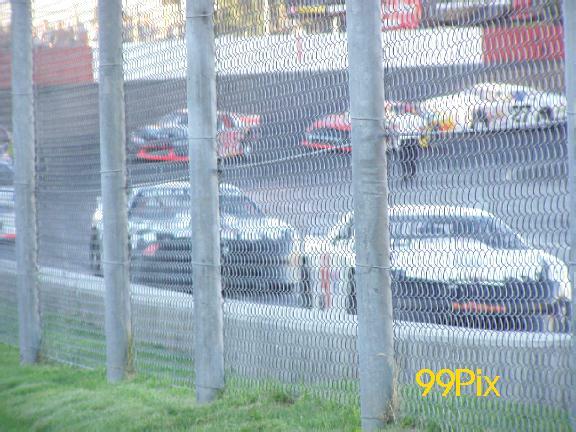 A caution flag quickly followed, due the Dave Houge of Elk Grove stalling on turn two. 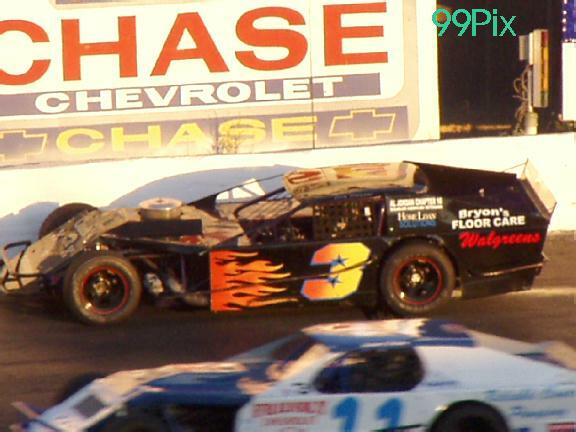 The commotion caused Danny Contessotto of Stockton to reverse into Modesto’s Harry Belletto, #74, ripping off part of his car’s side panel, exposing the frame and sending debris flying. Moore and Monroe went head to head after the restart and were followed by points leader Eric Schmidt of Roseville in lap 11. 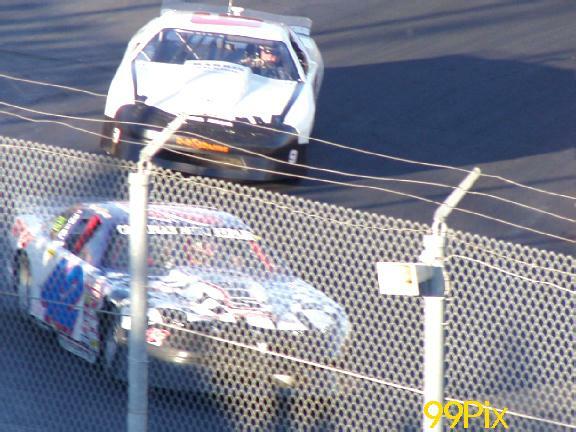 Moore went high on turn two opening up an opportunity for Monroe to go low on lap 12 and hastily took the lead. Halfway through the race Dave Byrd, #9, of Pacific Grove bolted into first after the second caution flag and was trailed by Monroe and Pete Anderson, Jr., #5, who battled it out until Anderson, Jr.’s engine abruptly burst into flames with four laps to go. Dave Byrd was poised to grab the opportunity as he raced into the lead following the caution flag, for his first victory of the season. Bryd was chased by Monroe who placed 2nd, Contessotto 3rd, Harry Belletto 4th and Eric Schmidt finished 5th. 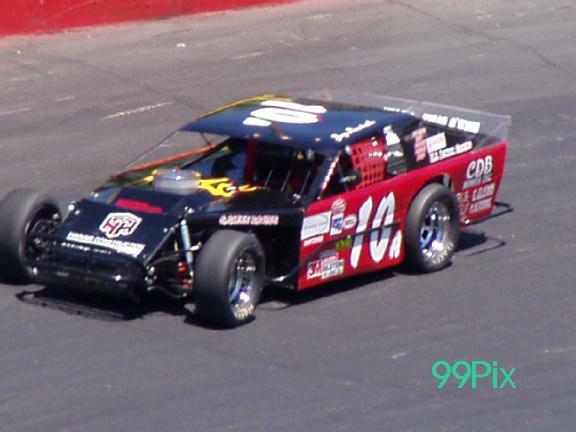 Jay Linstroth, #10a, of Citrus Heights broke his own fast time track record last Saturday. 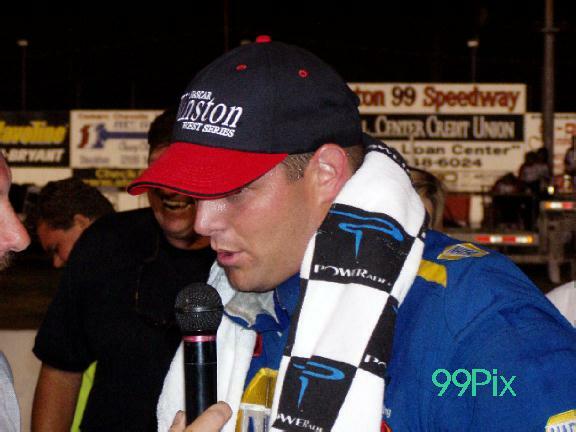 Linstroth set the fast time record of 13.792 on July, 19 2003 and broke it by one-hundredths of a second for the new fast time track record of 13.791. 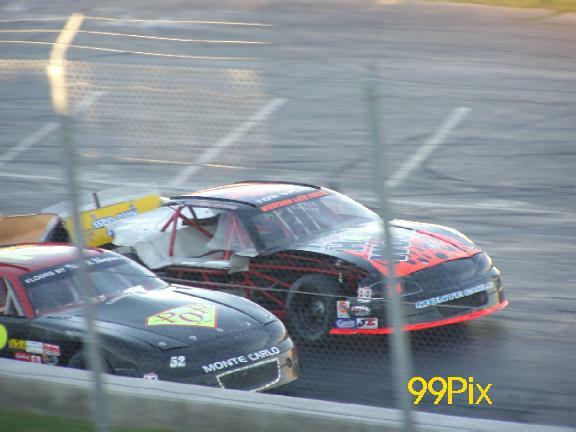 Linstroth followed his fast time with a dash win, but lost his momentum in the main event and placed 5th. Chris Mays and Joey Stearns, #3s, both from Stockton went two wide after the start, until Mays slowed allowing Stearns to race into the lead. Angelo Queirolo, #100, of Ripon and Mays followed, battling for second. Queirolo’s persistence paid off as he swiftly passed Mays and Stearns jetting for first. 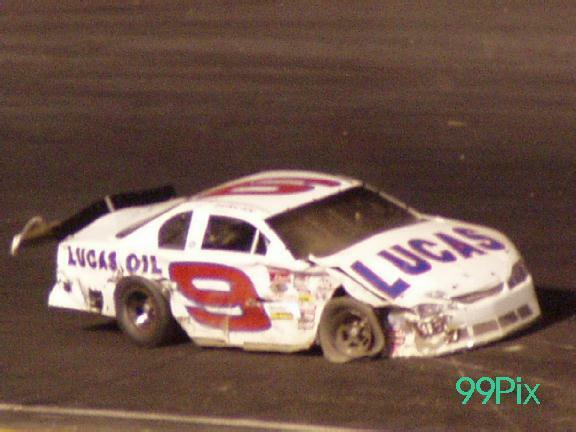 With twenty-eight laps down Stearns abruptly stopped high on turn two causing the caution flag. After a great ride by Stearns he was out of the race due to engine problems. On the restart, Queirolo set the pace and Linstroth had the outside position. It was a close battle for the checkered flag. Queirolo was on a mission for the victory and took the lead without hesitation smoking the competition for the win. Linstroth was out maneuvered and was passed by Jason Philpot of Sacramento who took 2nd, Sam Solari, #6, of Salida was 3rd, and Mike Regelman, #66, was 4th. 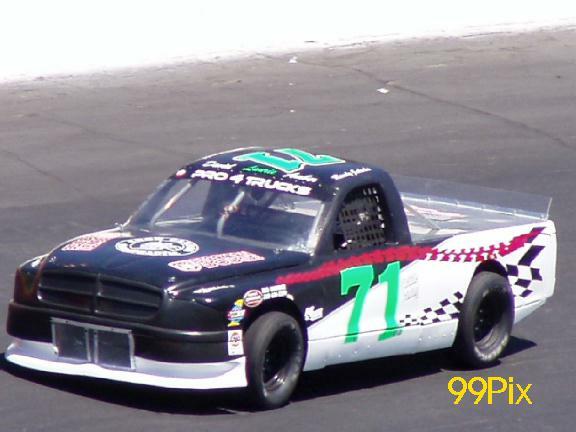 In the Pro 4 Trucks division, dash winner Randy Jahoda, #71, of Tracy claimed his second victory of the season. Jahoda put a lashing on the competition Aug. 16th and will return to defend his spectacular finish and increase his 614 points on September 13th. Trevethan and Jahoda rallied side by side for the lead until Jahoda was bumped leaving the door wide open for Trevethan and Mike Brooks of Manteca to slip by. Jahoda regained control and quickly passed Brooks working his was to the lead. Trevethan’s truck started smoking and was out the remainder of the race. After the caution flag, Jahoda captured the lead and the victory. Points leader Carrie Miller of Saratoga was in hot pursuit for second place, trailed Dave Wright of Manteca in third. Miller was working feverishly to keep the persistent Wright from passing. In lap sixteen Miller look turn two a little loose, opening up an opportunity for Wright to capture her position. Wright took 2nd at the finish, Miller placed 3rd, Ron Robeck of Milpitas was 4th, and Bruce Hopper of Manteca was 5th. 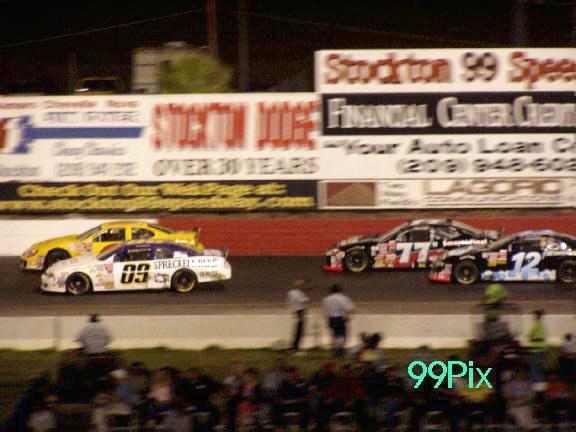 Stockton 99 Speedway will be closed on Aug. 23, 2003. 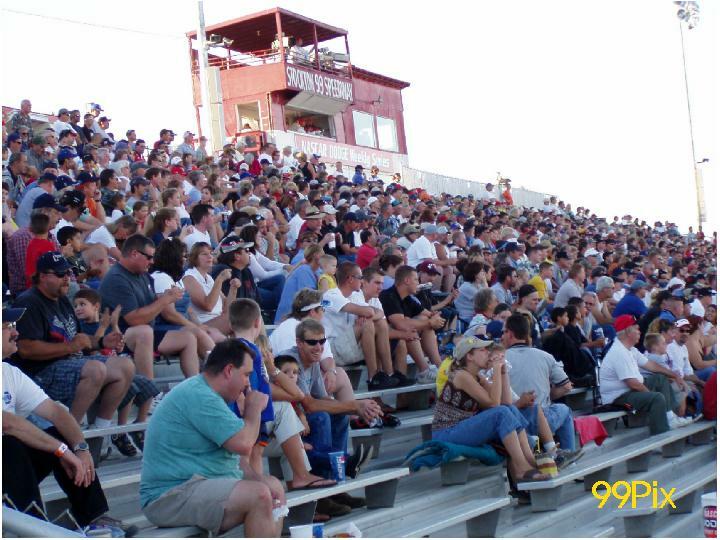 Racing action will return on Saturday, August 30, 2003 for the "Hot Wood Tri-Holiday Classic 100" The evening will include four big main events including Western Late Models, BCRA Midgets, the popular Pure Stock and Legends. 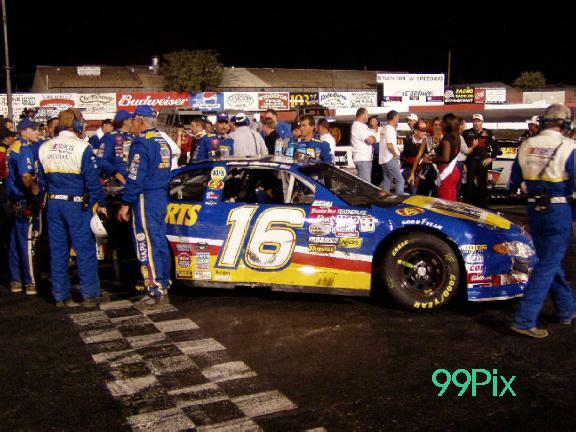 STOCKTON, Calif. (Aug. 16, 2003) – It did not take long for Austin Cameron, #16, to return to victory lane in NASCAR Grand National Division, Winston West Series competition. Cameron, who missed four races earlier this season while undergoing cancer treatment, dominated the action at Stockton (Calif.) 99 Speedway on Saturday, Aug. 16, in winning the NAPA Auto Parts 200 by Dodge Country and Havoline. It was just his second race since returning to competition last month. "It feels like the first one," the 26-year-old El Cajon, Calif., driver said of the victory. "I don’t even know what to say. I wanted to cry almost. Just to come back after everything my family has gone through and what I’ve been through … it’s pretty emotional." The dominant fashion in which he won was reflective of Cameron’s performance of a year ago in which he won five of 10 races on the series schedule. 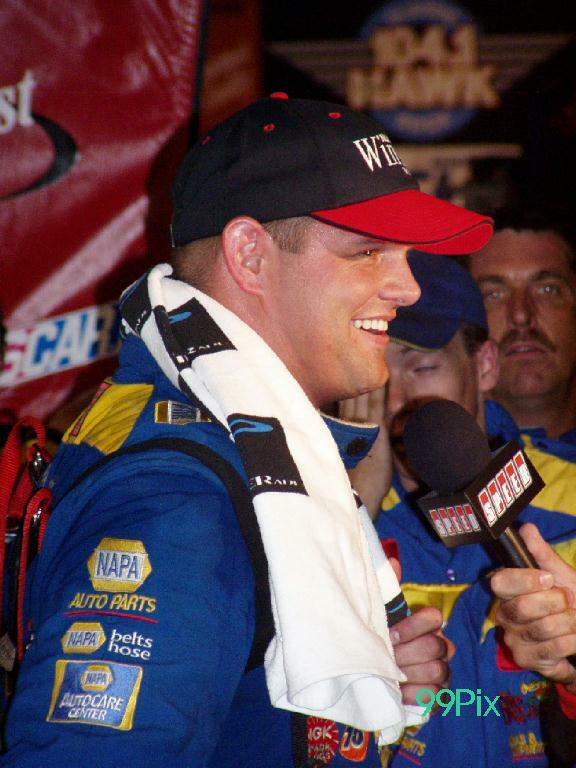 "I was on another level," he said after setting a track record and leading 154 of 207 laps. "I just felt awesome. The car was great." Cameron did not go unchallenged, however. 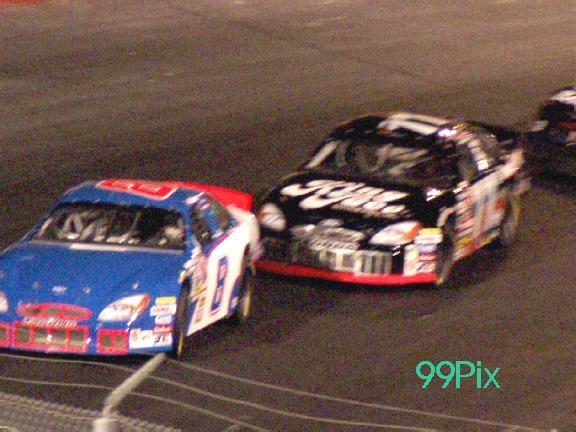 "The only slip up I had was when Mike David, #2, got under me," he said of being passed on lap 17. "That was only because I was being very cautious. 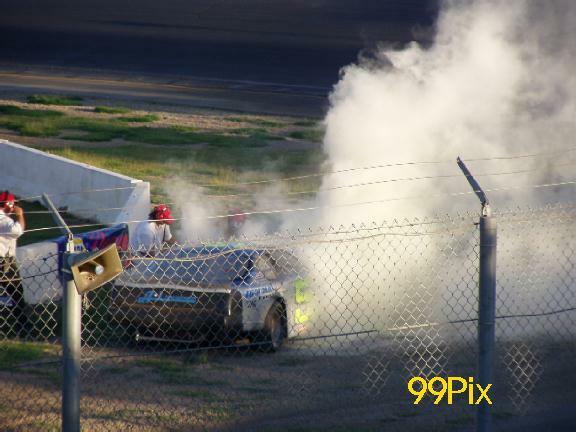 My spotter said there was a wreck. There was a car up against the wall. So, I assumed a yellow was coming out. David snookered me. He got underneath me." 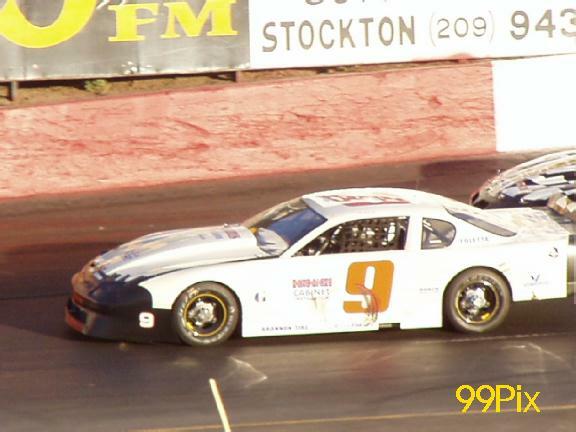 Despite track position being so critical on the tight quarter-mile Stockton track, Cameron said he was confident of being able to get the lead back. "I could pretty much tell how David was driving the car," Cameron said. "He was getting all of it out of it. I didn’t think I was using mine up that much. He kept getting loose on the exit. I knew that if I gave it 20 or 30 laps that we’d be right there." 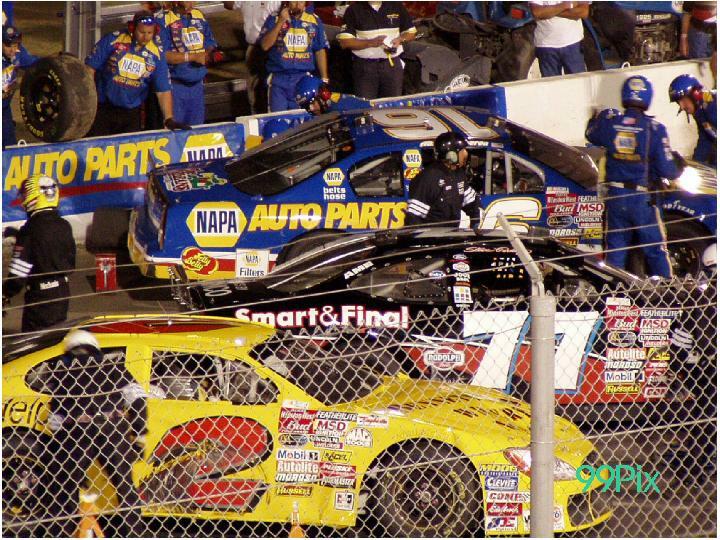 Cameron nosed his NAPA/NAPA Belts & Hose-sponsored Chevrolet by David’s Ford on lap 70 and paced the field to the midway point. He opened up a bit of a margin in the second half of the race, as David and Steve Portenga, #77, battled for the runner-up spot. Cameron saw his lead evaporate, however, when a late-race caution caused the scheduled 200-lap event to be extended with a green-white-checkered finish. Cameron held on to win by .806 of a second – at an average speed of 46.645 mph. His victory netted him $8,241 in prize money and posted awards, including the Bud Pole Award. Cameron led nine other drivers in eclipsing the track record – with a lap of 63.672 mph. It marked Cameron’s ninth career Bud Pole Award, to go along with his seventh career victory in the series. "To come back and win the second time back is pretty phenomenal," he said. 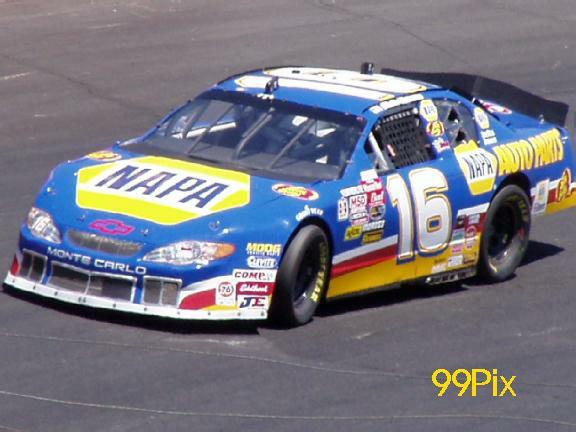 "I can’t say enough about NAPA Auto Parts and Bill McAnally for putting me back in the car." Portenga, who led the championship standings by one point coming into the event, finished second in the King Taco/Smart & Ford. 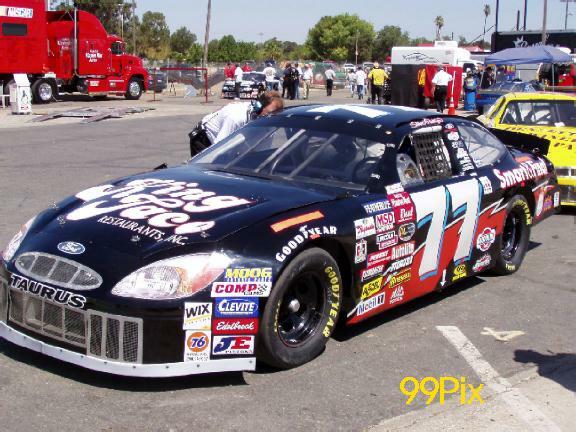 David, #2, of Modesto, Calif., took the third spot in the Injury Helpline.com Ford – with Brett Thompson, #61, of Jerome, Idaho, coming home fourth in the Rich Thompson Trucking Chevrolet. 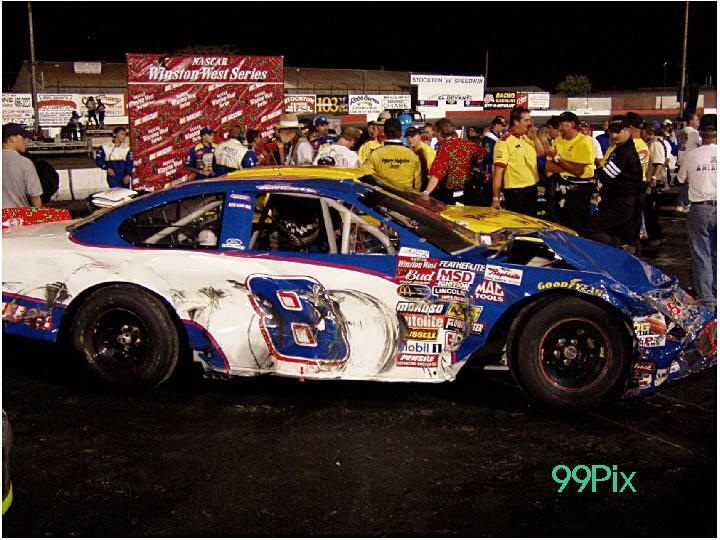 Johnny Borneman, #8, of Ramona, Calif., finished fifth in the Borneman Plastering/Red Line Oil Ford. 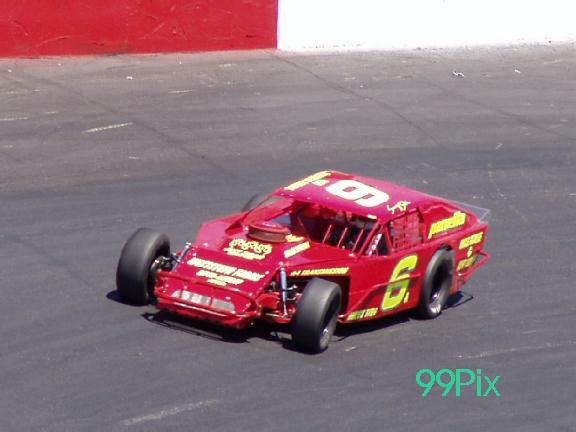 Completing the top 10 were Mike Duncan,#9, Mark Reed, Kevin Richards, Scott Lynch, #08, and Scott Gaylord. 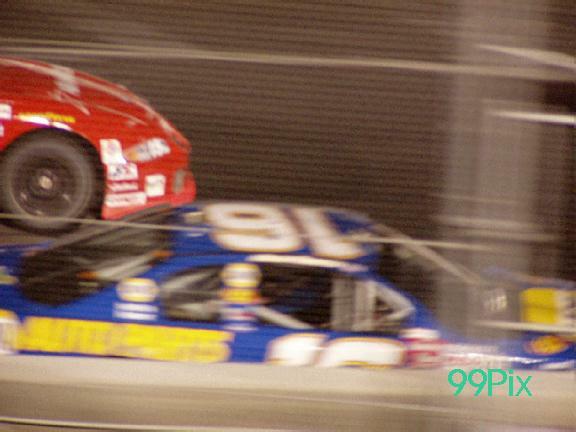 The race was slowed by five cautions for 36 laps. With his runner-up finish – Portenga, #77, of Sparks, Nev., built his lead in the championship standings to 33 points (1,238 to 1,205) over Lynch, the leading Raybestos Brakes Rookie of the Year Candidate. Duncan, #9, remains third in the standings with 1,201 – trailed by Gaylord with 1,173 and Richards with 1,162. Borneman at 1,138, Thompson at 1,096, Jim Inglebright at 1,093, Reed at 1,086 and Gene Woods at 970 complete the top 10 in the standings. 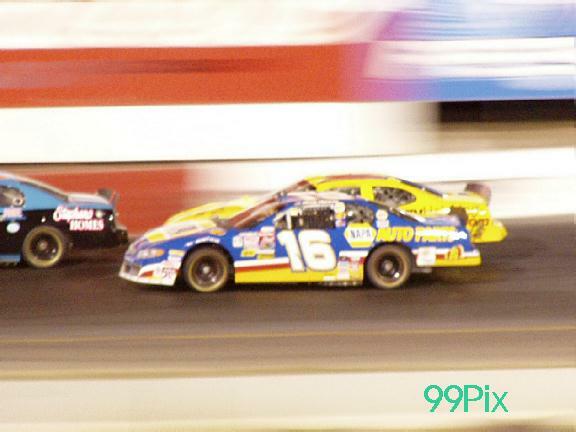 The next event on the Winston West Series schedule is the NAPA 200 at Rocky Mountain Raceways near Salt Lake City, Utah, on Aug. 30.